It was so nice to get out and shoot some personal work this week. 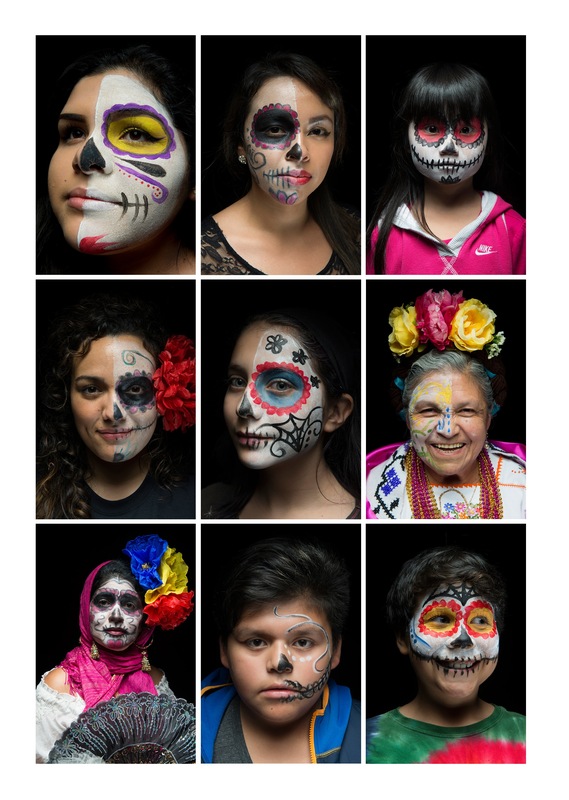 My colleague Matt Mills McKnight and I collaborated on a series of portraits of attendees at a Dia de Los Muertos event hosted by El Centro De La Raza in Seattle. We loaded in and taped up a black roll of paper in a nook of the jam-packed hallway and set up a few lights to enhance the spooky vibe. Matt found many great people to stop by the makeshift studio in the short time we had there. I focused on the beautiful makeup and I am grateful to everyone for welcoming us in. I can’t stop thinking about my 9-5 shift in the office of David Hobby and Joe McNally at the first stop of The Flashbus Tour in Seattle. 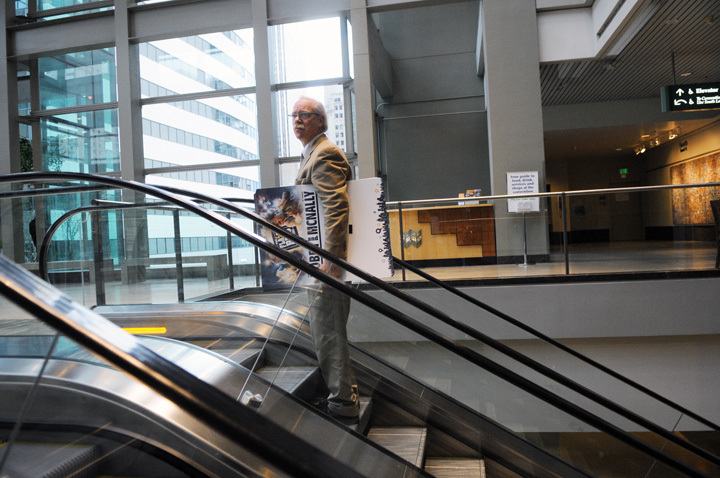 It took place over the course of a far too nice day out at the Washington State Convention Center on Friday Mar. 11. It should be said, upfront, that this was an unapologetically geeky event. Hobby, wearing his trademark shorts, came out to the greet those waiting in line. There was nary a camera-less hand in sight among the predominantly male crowd. I had an interesting shoot last Wednesday with the women’s soccer team over at Shoreline Community College. The intermittent rain made me question if the shoot was going to work out, but luckily it held off for the entire duration. 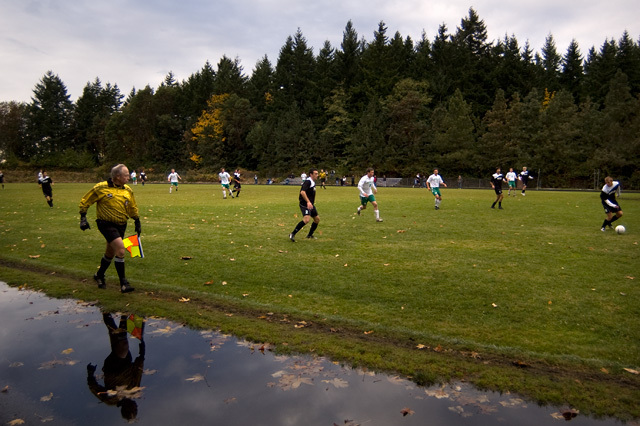 I waited around for the girl’s to finish their cooldown, and shot this image of the men’s game going on. It gave me an idea for later, but more on that in a bit. After SCC’s unfortunate 1-0 loss to Green River, the women’s defenders, still mud-soaked from their game, agreed to let me make their portrait. 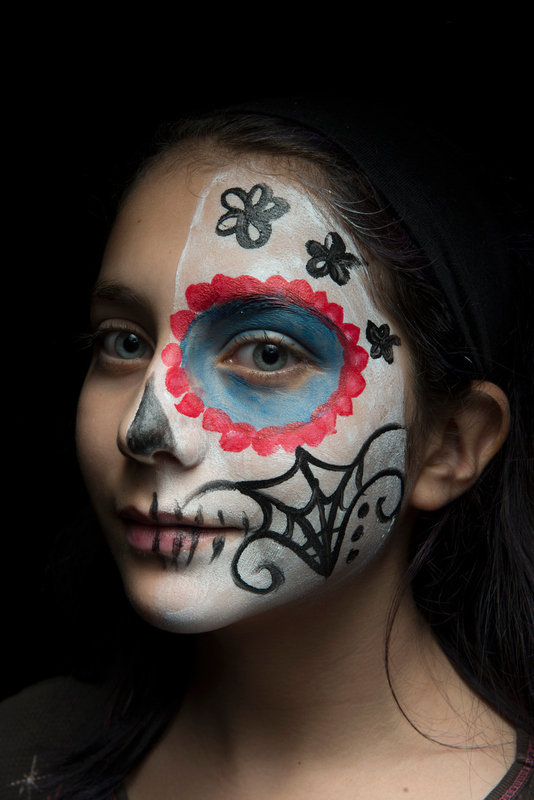 I set up 2 SB26 strobes, bare-bulb, one camera-left and high, and one far-right, aiming back at the womens’ faces. I like the drama those rain clouds add, as well as the muddy clothes. Tough ladies who clearly mean business. The first shot I wanted to accomplish was a kind of CMA shot, just some basic stuff. I asked the girls to act serious for a frame, and this was more difficult than I would have imagined. It was around this time that I thought about trying to work the neat puddle onto the ground into something more. 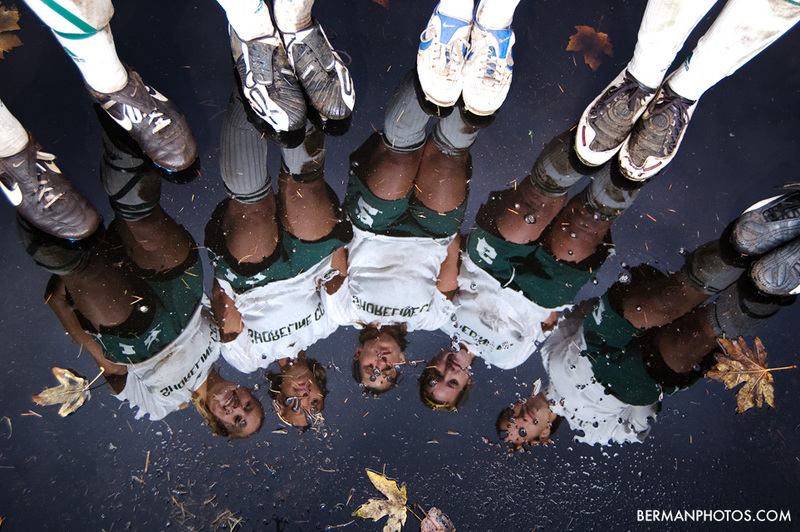 I re-aimed my flashes towards the girl’s faces, and tried to shoot just the team reflected in the puddle. I like how this one looks, but it might have been neat to hand the center girl Brittany my camera, and use a remote to trigger it — that way I could have shot this image “right-side up”. There is always next time…. Thanks for looking everyone. Comments always appreciated.